Why Is My Senior Loved One Bruising? When it comes to providing quality care for any senior adult, being on the lookout for different health issues and concerns is always of the utmost importance. When it comes to elderly adults, these concerns of course include bruising. Most seniors start to bruise easily as they age, and start to develop bigger and darker bruises as they continue to grow older. 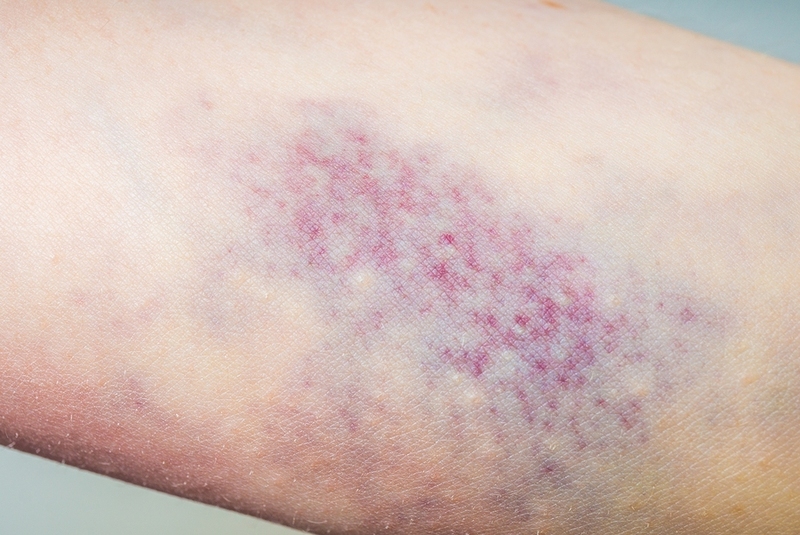 In humans, bruises typically form when small blood vessels, also known as capillaries, that are near the surface of the skin break under the impact of an injury. Bruises can happen virtually anywhere, but they are most common in seniors on the arms and legs. When this type of impact happens and the capillaries break, blood leaks out of them and they leave behind those signature black and blue marks. As the body begins to heal and eventually reabsorbs all of the blood, these marks will disappear. In general, there are certain people, in most cases women, who just tend to be more prone to bruising than others. As for seniors, the most common reason they tend to bruise more easily is because their skin because thinner as they age. When seniors grow older, they also lose some of the protective fatty layer around the skin that also protects these blood vessels from getting injured. In short—the blood vessels are more susceptible to injury and since the skin is so much thinner, it is easier to see these pools of blood develop when capillaries are broken. However, these aren’t the only reasons that seniors seem to deal with bruises more often than in younger adults. There are also situational reasons that seniors tend to deal with bruises more often. Seniors, in general are more prone to bruises because they are more prone to bumping into items they can’t see and they are more prone to falling. These things can cause bruises to happen more often in seniors. Medications and supplements such as aspirin, antibiotics and anticoagulant medications can all cause a senior to bruise more easily. Vitamins including ginkgo, anti-platelet agents and medications used to treat allergies, asthma and eczema may also increase a senior’s chances of bruising. In general, you should always ask your loved one’s doctor about the side effects of any medications they may be taking or talk to them about medication side effects if you are concerned that their prescriptions may be causing bruising. In some rare cases, where seniors all of a sudden start bruising and bleeding easily, or when they start bruising on the trunk, back or face for no known reason, there may be a more serious problem to blame, and seniors will want to make sure that they are visiting their doctor for further diagnosis.